First the question everyone reads my interview for, how awesome am I on a scale of 1-10? You can go higher than 10. Oompa loompa doopity dawesome, Melly is off the scale, she’s so totally awesome!! As a HRM, can you smack people around? Actually, as a HRM I take more abuse, than I give. It’s a thankless job, but somebody has to do it. Is it hard for you to stay on top of everything? Is it true you work for free? No, it’s not. I may be easy, but I’m not cheap. I earn Shrutebucks, the official currency of DMI. The more Schrutebucks I earn, the higher I climb the corporate ladder. Back in September, I was a lowly temp but look at me now, Baby! Of course there’s no cheating on DMI, right? Definitely not!! Cheaters are not tolerated at DMI. And if caught, well, I’ll just say that you really don’t want to get caught cheating. Been there, done that, and it is not pretty. You get called nasty names, hate mail, and they have even threatened virtual beheadings!! Of course the “No Cheating” rules went into effect after the Big Cheat Fest of 2008, (a.k.a. Duckiegate) in which I was crowned as the Queen Cheater of DMI, a title I still hold to this day. I’ve got a really cool crown, and a really bad reputation (LOL). Okay, enough about you. What is your favorite book by me? Oh, did you write a book? I must not have got the memo or I am too much of a Dunderhead to read it. I have an important question for you. If you’re walking through the woods and you see a pile of nut shells on the ground, what might be lurking nearby? I don’t go in to the woods for this very reason. 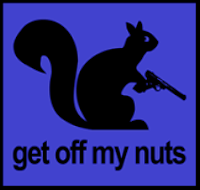 Beware of Gangsta Squirrels. Those drive-by nuttings can kill a person or at the very least, break a bone. Okay, now the hard hitting question. What is your favorite day of the week? Thursday is my favorite day of the week, for many reasons. “The Office” is on, it is “payday” at DMI, and for me, it’s all about the Shrutebucks. Also, in real life, it’s my actual Friday. I do have a real job, really I do, although I seem to spend most of my time at my real job doing my fake job. Who would you do? Ryan or Jim? Ryan, most definitely. How do you think I got promoted to HRM so fast? I didn’t know, but you must send me one soon!! My favorite book so far by Melanie Anderson is “Good Times in Hawaii”. It was one of her earlier works, and if you didn’t get a copy of it when it was first published, then you are never going to get to read it. If you have a copy, it’s going to be worth millions one day, I guarantee it. You’ll find my copy on eBay when this does happen. Of her more “known” books, I really loved Born to Run. I’m sure Racing for the Shore is even more fabulous, but that is still in my TBR pile, but I promise to read it soon. As soon as I reach the ultimate goal of “Assistant Regional Manager” at DMI that is. I really don’t do anything else with my time except chase those elusive Shrutebucks. It is becoming a real problem. But like they say at DMI.. dinkin flicka. Recruit? Did you say I could recruit? Obviously, if you are a fan of the “The Office” then you must join www.dundermifflininfinity.com And if you want to work for the best branch at the company, you should apply to Rochester, NY. Tell Shakymon, the Regional Manager of Rochester, that Duckie sent you. On second thought, you might have a better chance of getting hired, if you don’t mention my name. My reputation proceeds me. It's simply beyond words. It's incalculable. We in the Rochester branch love our Duckie. She's the best! She's always helping her fellow employees. She even helped design this handsome flask for our company catalog. She'd appreciate your vote of approval.